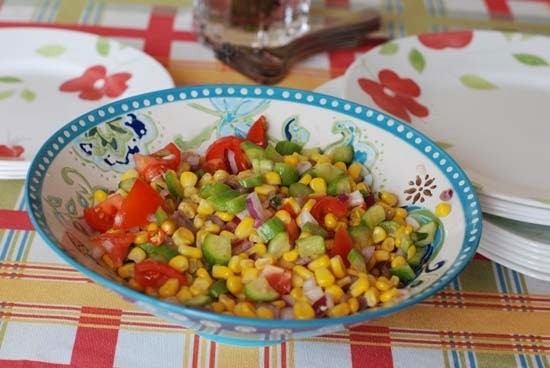 This post is going to be about a quick and easy Corn Chaat for you to serve as a side with all the barbecuing you might be doing, but more importantly about Legos and my rant. So, bear with me. A few weeks back I was at LS's school(kindergarten) for some show that they had put up. As expected there were other Moms there, most of whom I had never met, and pleasantries were exchanged. In lieu of these conversations a mother of a little boy asked me, "Does LS play with Legos?". Her voice bordered just that little bit on curiosity and disbelief. I was a little taken aback by the question. A big box of Lego is very much a part of our play room. It has been so for years now, since Big Sis was born. 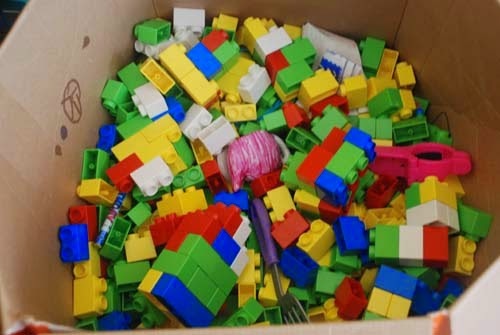 Many years ago, my previous workplace was donating boxes of basic Lego bricks after a lego competition and I had lugged a huge box home anticipating a future where I would not have to buy any other toys, because of course there were Legos. These were the basic Lego bricks, in red, blue, green, yellow and white, all the exact same size. When BigSis was around two, I bought her another Lego box, this one too just had the bricks but they were at least in various sizes. And since this huge pile of Lego takes a prime spot in the playroom, it was only natural that LS got introduced to it. So, I wasn't really sure what this lady wanted to know and I said, "Yes, LS does play with Legos. But she plays all kinds of things with them". Which is in fact true. 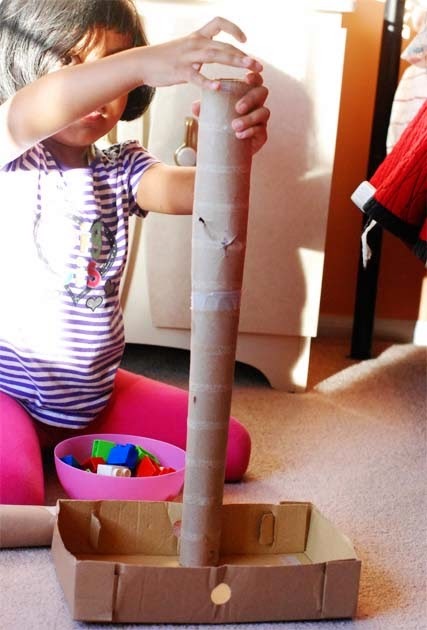 LS uses Legos to make food for her kitchen, she uses them to make cake, to make cell phones and even wrapped cereal bars !!! She even devises complex games, like shown above where one player has to throw legos down a chute and the other has to guess the color, to play with them. 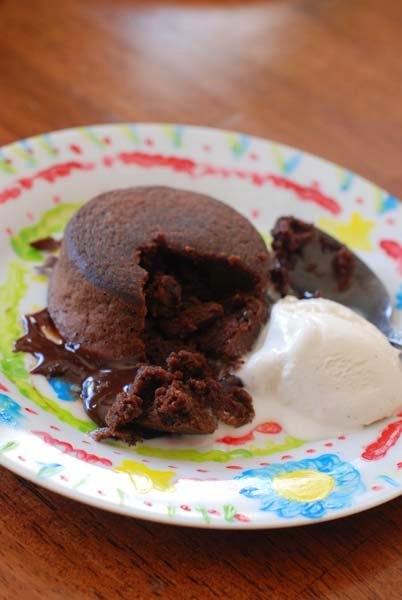 Yesterday, Big Sis made Chocolate Lava Cake. For Father's Day. LS was supposed to help her make it but she didn't. The day before she had done the grocery run with me getting the supplies so probably she felt she had done her part. Thankfully, though it was Daddy's Day, BS made four lava cakes, one for each of us. I wouldn't have helped her otherwise.I love cakes with soft gooey chocolate-y centers. And if I had not helped her, those Lava cakes would have been perfect. But then who is perfect ? Not me atleast. In my usual "not-glancing-at-inconsequential-details" nature I put the oven temperature at the regular temp for all cakes. Only when the cakes looked ah-well a little under-cooked did we realize that Lava Cakes require a higher temperature of around 425F. That helps to cook the exterior fast while the inside is still soft and gooey. Yeah, basic science. So, anyway we raised the oven temp and let the cakes bake for few minutes more. This time they came out perfect. Almost. I mean they would have had a more gooey center had I not acted "oven-temp-know-all" in the first place. 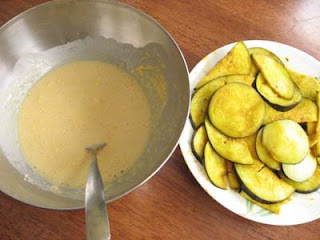 For the next letter in the A-Z of Bengali Cuisine, B, most of the readers said Beguni, a very popular Bengali snack, where slices of eggplant are dipped in a chickpea flour(besan) batter and deep fried. Eggplants or Brinjals are known as begun in Bengali and so all things that are cooked with begun came a close second and third in the B-series. 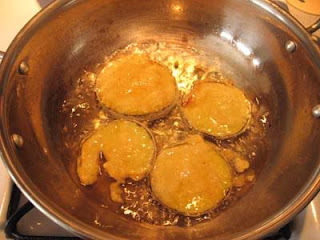 Begun Bhaja -- slices of eggplant shallow fried in oil. I could not leave Bandhakopi'r Ghonto out of the B series though no one really mentioned it. But trust me, this cabbage dish is very much a part of the Bengali culture and household. Borar Jhol -- Lentil fritters in a gravy is another of my favorite dish with the letter B. Another important part of Bengali cooking that starts with a B is "Bori". Bori is a sun-dried lentil dumpling made of ground lentil paste. The ritual of "preparing bori" called "bori deoa" is (or rather was) an age old custom among Bengali women during the autumn and winter months when the sun was warm and strong but not scorching. Women of the household led by the most senior member would bathe early at dawn and then immerse themselves in the task of bori making. It was a ritual made almost sacred with its demands on sanctity. Large quantities of lentils were ground on the sil-nora, then seasoned and whipped early in the morning. Then large expanse of a washed and dried cloth, usually a washed and dried sari would be set out on the terrace, its edges secured by rectangular pieces of red brick. On this cloth, the women would put scoops of the lentil paste, ensuring a peak at the center of the dumpling. The couple of times I have been involved in this activity dates back to the times my grandmother was around. I remember her telling us to make boris with sharper center peaks, the incentive being that the one whose bori had the sharpest peak would have a sharp nosed husband. For us children, the main task however was to keep away the birds and crows from pecking at the dumpling while they dried in the sun. Once the dumplings had soaked in the autumn or winter sun and dried to a crispy brittleness, they were gently picked from the cloth and stored in containers. 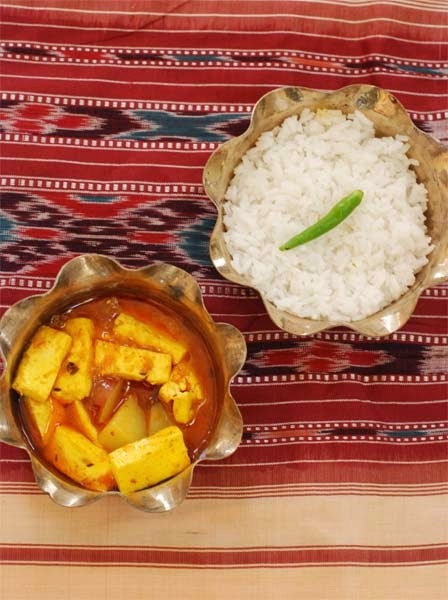 On days when fish or other vegetables were rare, these boris would be fried a crispy reddish brown and served as a side with dal or dunked in the broth of "jhol". In some regions of Bengal, bori making is more of an art than a mere ritual. The patterns and designs are so exquisite that these are called "Goyna Boris" or "Noksha Boris" as the lentil dumplings have beautiful patterns like jeweleries. There is more about these boris in the blog Homemaker's Diary-Goyna Bori. This post was first posted in 2010. It is being reposted. The rain had started out strong, not meek like other days. Huge blobs of water, hit the warm earth rapidly, with an urgency to quench out its parched dryness. The rain was now hitting down hard on her window, with that drumming sound, she loved about rains. Outside the windows, the world seemed painted by Monet. She could hardly make out anything, even the Krishnachura by Bubai's house with all its red flowers was barely discernible. She sighed and returned to the open pages of the Resnick-Halliday, trying to figure out the resonant frequency of some stupid string of length L while the rain drummed on merrily on her windows. "I will put these up for drying in your room", Ma said, a pile of still wet clothes on her arm, droplets of water clinging on to her jet black strands. Not waiting for a response, Ma started putting up a makeshift clothes line, right above her study desk. As the fan whirred slowly trying to dry out the clothes she sat beneath Dada's dancing pajama legs still trying to figure out the string. She could hear Ma in the kitchen now, the pots clinging, the whoosh of water down the sink. And then she could feel the sharp smell of Mustard up her nostrils. The hot oil now hissed as something hit and then there was the familiar sound of "chyank-chok", repetitive it went, the same rhythm, a "chyank" followed by a "chonk". Ma was making Beguni, brinjal slices dipped in a chickpea flour batter and fried crisp. 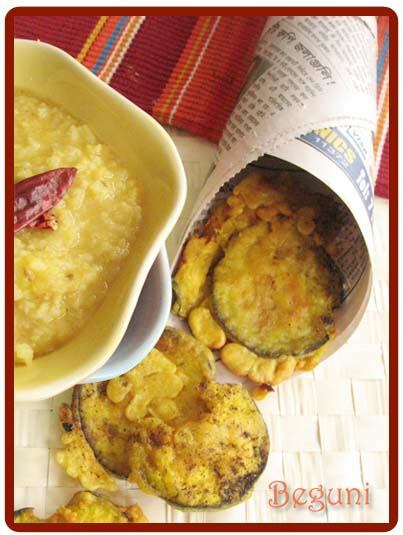 There would be Khichuri and Beguni for lunch, a rainy day staple. She hated brinjal and didn't care much for a Khichuri. But Ma would make an omlette for her, even one for Dada, she knew and smiled to herself. "PING"!! The sound startled her. She looked up and outside the huge glass window, the rain had trickled down to a drizzle now. The lights on the Empire State building glowed against the gray slated sky. She looked back at her computer. Her husband was on the IM. He wrote, " So shall I get some eggplants? what about Beguni and Khichuri tonight ?" Smiling she gathered her laptop and her belongings. She didn't want to miss the 6:15 subway home. 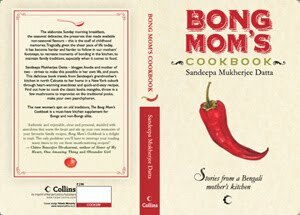 This is my first attempt at Food Fiction inspired by the fantastic tales of Kalyan@Finely Chopped. I often write about the past in my posts. The past is not perfect, the present more not so. While I write my regular posts, I stick to the reality, the truth, I don't transcend the fine line from reality to fiction. But this category of Food Fiction, lets me mingle my memories with bits of imagination, so the emotions and the nostalgia is still there but also there is a little bit of the author's creative mind in play. 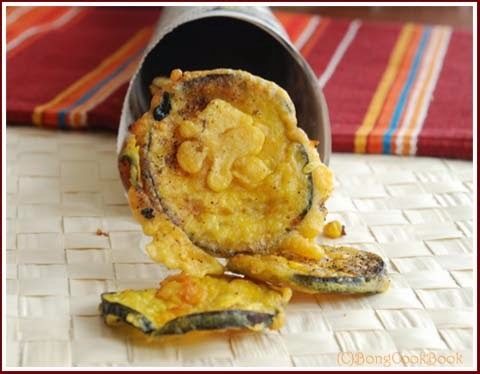 *Ashare Goppo == Monsoon Tales.Depending on its usage it also means "made up tales"
Beguni or eggplant slices dipped in a chickpea flour batter and then deep fried is a long time Bengali favorite. Actually anything deep fried is a popular Bengali or for that matter popular Indian snack. With Bongs, the thing is they adore their eggplants and so not being satisfied by Begun Bhaja alone they go a step ahead to make Beguni. The Beguni is a popular side kick to the Khichuri on rainy days and that is how we had it last week amidst pouring rain. If it is a high-dry day and no one wants Khichuri, Beguni is still very much welcome as an evening snack with muri aka Puffed Rice or as one of the fried veggies accompanying Dal for Lunch. Update: As one of the readers said, instead of Rice Flour you can also add 1-2 tsp of poppy seeds to the batter for a crunch. 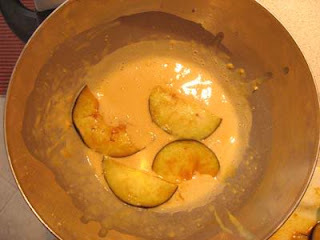 Also a little Kalonji/Nigella seeds in the batter may be added for an alternate version. Dip the eggplant slices in the chickpea flour batter so that it is uniformly coated and then gently slide into the hot oil. Fry till golden brown on both sides. Remove with a slotted spoon and drain on a paper towel. Sprinkle some Chaat Masala on the Beguni for that additional zing. LS's kindergarten class has a very interesting activity every year and it involves hatching chicks. Yes, fun isn't it ? They have a farmer bring in a hen and rooster to school and then set up an incubator with dozen eggs. Every day the kids are asked to rotate the eggs ever so gently and wait for the eggs to hatch. It is a week of great anticipation and I can imagine the level of excitement in her class. So after a week of waiting, 11 of the chicks hatched on one Tuesday in May. 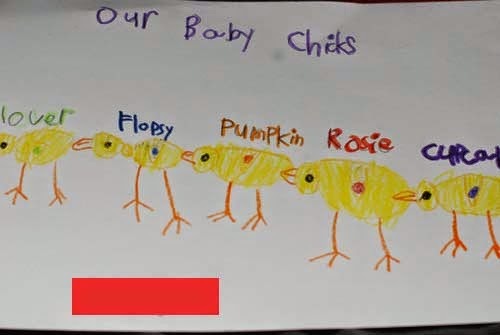 And the kids got to name them. Little Sis named hers "Rosie". Rosie, Rosie....why Rosie I wondered.The next day they were also allowed to touch and pet them. LS was pretty excited about the chicks and said that they were soft to touch and pooped a lot. I think I expected some kind of a reaction when we cracked eggs to make an omelet at home after this experiment but it seemed she was very aware that the eggs in her school were different from the ones we buy. "The ones at home are not fertilized eggs so it is okay to crack", she told me. "If you by accident get an egg by the side of the road and don't know if it is fertilized or not, then don't make omlette", she warned. Now to the Dahi Vadas which both Little and Big Sis seem to like. My Mother made lovely Dahi Vadas all her life. Perfect donut shaped vadas, with a neat hole in the center dunked in a sweet and tangy yogurt sauce. I of course loved the yogurt more than the vada. And I also liked mine with some Tamarind Chaatni unlike a Bong Doi Bora with a sprinkle of Bhaja Moshla. 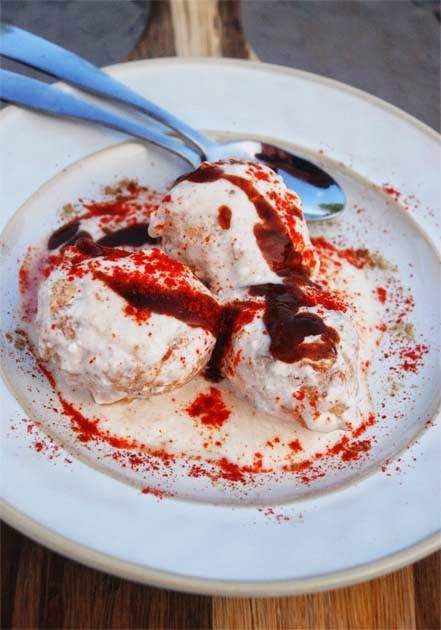 However what held me in awe about the Dahi Vada was the perfect hole at the center of the disk. My Mother would take a bit of the dough on her palm, do some magic trick, slide it into the hot oil and there would be vadas with a hole frying in the hot oil, like savory donuts, only then I had no idea about donuts. I could never ever crack that code. "How do you make a hole at the center of the Vada" -- seemed to be the greatest mystery of my life. Then one fine day, our babysitter from last year, who was a Gujarati and a really good cook, made Dahi Vadas. And she did not make a hole. In the Vadas that is. Her vadas were round balls like bigger pakodis. Maybe they were called "Bhallas" and not "Vadas". I am not sure. Honestly, you could have called them a "Bhatia" or a "Patel" and I wouldn't have cared.That one could make Dahi vadas without a hole at the center was a revelation to me. Without that hole, the lentil dumplings were mere dumplings which were not that hard to make. Well, there were still more things to crack like why did the vadas turn hard on some days , why do I worry all the time, why oh why it is June already...etc.etc. But until then here is how we make Dahi Vadas at home. And I still like the yogurt far more. Soak 1&1/2 Cup of Urad Dal in water for 10-12 hrs which means overnight. Adding minimal water make a thick paste. The water should be just enough to make the blade spin and should not make the batter liquid. Whip the batter well with a fork for 5-6 minutes. This will make the batter fluffy and airy which in turn will result in softer vadas. Drop the batter with a spoon, a small scoop or with your fingers into the medium hot oil just as you would do for a pakodi. 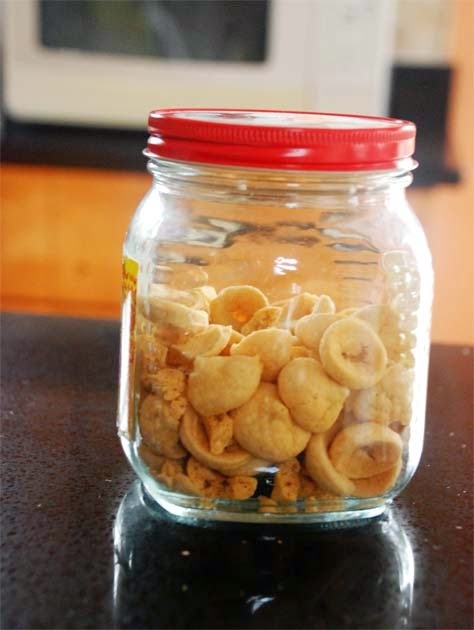 Don't worry about the shape, they will be spherical but not necessarily uniformly so. Fry the vadas till they are golden brown. Take out with a slotted spoon and drain the excess oil on a paper towel. Wait for about 6-8 minutes and then dunk the vadas in lukewarm water. Let the vadas soak for about 15 minutes. Now get the Yogurt ready. My favorite part. Whisk the yogurt well so that you get a smooth, creamy texture. Give a good mix. Taste and then adjust the above until yogurt is sweet and tangy. Now pour the yogurt over the vadas so that all the vadas are submerged in yogurt. "If we did a A-Z of Bengali Cuisine, what dish would you choose to start with A?" There was a huge response of about 78-77 answers and guess what ? The winner was Aloo Posto, as I had feverishly hoped.Please God, please, let the folks say Aloo Posto and then I can have one more reason to cook and eat it. Not that eating Posto needs any reason or season but it is always nice to have some validation. Now "Aloo Posto" or Posto with Potatoes is actually a dish of posto or poppy seeds where the aloo (potato) is simply a qualifying adjective. This posto in Bengali cuisine is so versatile that we could do a whole A-Z of Posto with Aloo Posto, Begun Posto....Zucchini Posto and not even so much as glance at any other dish.But still the general consensus was that "A for Aloo Posto" is uniquely Bengali and even though there might be a North Indian aloor dom or a Mexican Mango Chaatni, there could never ever be an Aloo Posto that spoke anything but Bangla. 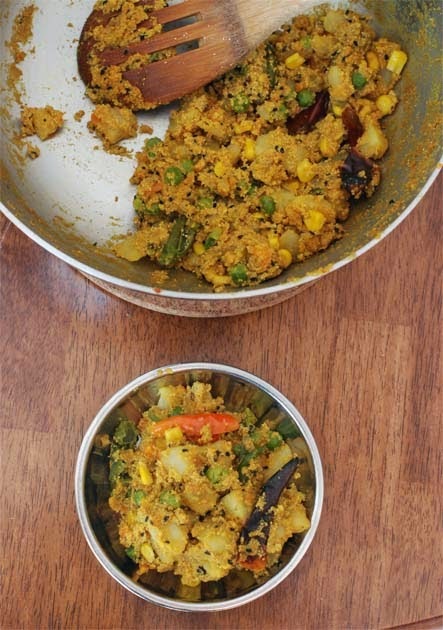 Aloo posto was one of my very first dish on this blog some eight long years back. A lot of water has flown in the Ganges and Hudson since then but this dish is still a favorite in my home and heart. "Posto or Poppy Seed is an oilseed obtained from opium poppy. The seeds are harvested from dried seed pods and have no narcotic effect. Posto or the dried white poppy seeds are hugely popular in Bengal. It was actually the food of the people of Rarh, the "land of red soil" on the westernmost corner of West Bengal. More so for the people of Bankura and Birbhum district in this area. This region has a very dry and hot climate and they believe posto has the effect of a coolant and protects them against the heat. 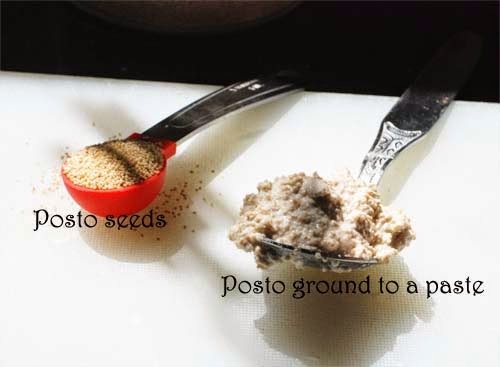 In the days when there was no restriction in cultivating Indian poppy and farmers in this area grew poppy in abundance, the posto seeds became an integral part of their diet. A mid morning meal of posto and bhaat protected the farmers from the searing, dry heat as they worked in the open fields. But the reason why they started growing posto or poppy seeds goes back to the 18th-19th century when the last Bengali Nawab was dethroned by the British East India company. The East India company found that opium generated huge profit not only in local markets but also in China. Thus started the Indian Opium trade. The conditions in Birbhum-Bankura area were probably most suitable for poppy cultivation and the reason why the British colonists forced farmers in that area of Bengal to grow mostly poppy on all available agricultural lands. It was natural that farmers in those areas had little choice but to incorporate posto, the dried poppy seeds a by-product of the crop, in a suitable form in their daily meal. They ground the dried seeds to a nutty flavored paste(posto bata) which they had either raw with some seasonings(kaancha posto bata) or cooked with whatever little vegetable they could avail of. Little did they know that a dish invented out of necessity would one day be representative of Bengal." Posto was mostly cooked in my home during the summer months keeping its cooling properties in mind and so it felt perfectly the right dish for a sunny, warm day in May today. Soak 1/4th Cup of White Poppy seeds in water for 10-15 minutes. Next strain the water and then wet grind the seeds in a grinder with little splashes of water. 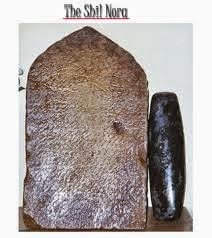 Ideally the seeds would be ground on a flat block of stone called shil-nora. The grinding should ensue a creamy white paste. Alternately, you can also dry grind the seeds to a fine powder in a spice grinder. mix water with the powder to make the creamy paste. Peel and chop 1 large potato in small cubes. When the spices start popping, add the cubed potatoes. Saute the potatoes with a sprinkle of turmeric powder. Now this turmeric is a cause of much consternation as there are two camps-- one who believes in turmeric in posto while the other doesn't. Choose which party you belong to. Saute the potatoes until they are a pale golden brown. Don't over fry them. Now add the posto bata aka the poppy seed paste. Mix well and saute for a few more minutes making sure that the posto has coated the potatoes. Now add water(about 3/4th cup), salt to taste, give a good stir and cover and cook. Check for potatoes to be done. Once the potatoes are cooked, open the cover and drizzle a little Mustard oil. Give a good stir and cook for a few more minutes until the water has dried off. Now on most days I throw in some vegetable or the other along with the potatoes and posto. The most recent usage by the husband-man has been about half cup of frozen vegetable mix(a mix of carrots, beans, corn and peas). He defrosts half a cup of this vegetable medley and throws them in with the potatoes. It tastes oh so good and looks as good as in the first picture.